Click the headings below to expand each category. I’m always trying to add new fun Isadora Moon things to make and do, so check back here regularly for updates! This project is to make a Pink Rabbit just like the one I take to events. Some components may not be safe for very young children, and it will require an adult with some sewing confidence to make. This project is a simplified version of the Pink Rabbit I made. It uses materials easily available in most craft shops and doesn’t require a sewing machine or any special equipment. Read about The Isadora Moon Guide to Writing Stories in this blog post. 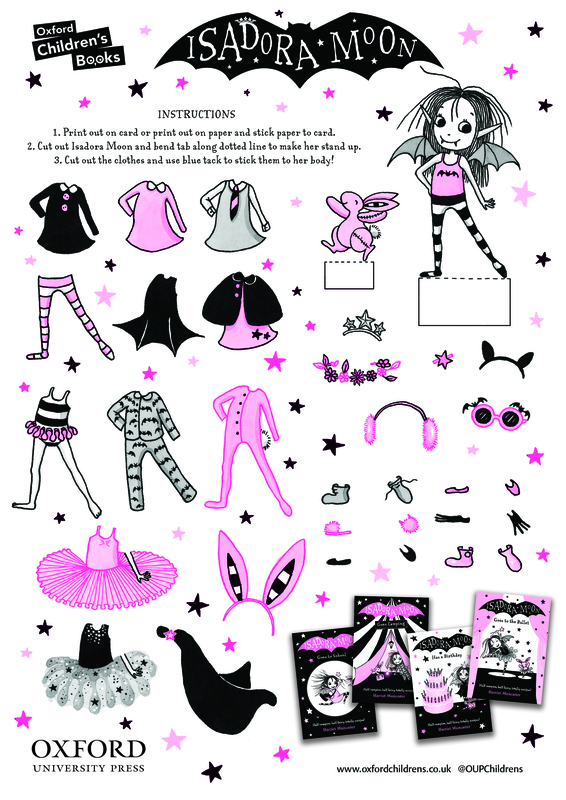 Host Your Own Magical Isadora Moon Party! Read a behind-the-scenes look at the food in the Isadora Moon Party Guide here. Read about the Isadora Moon mini-books and see more pictures in this blog post. This practical step-by-step guide to writing stories uses examples from the Isadora Moon books to show children how they can create their own stories. It does not require children to already be familiar with Isadora Moon, though enthusiasm for the books could be helpful. Individual activities could be adapted from the guide for classroom use, or the whole guide could be adapted into a longer project over several weeks. Whole Class Starter Activity—Roll the dice (volunteers could do this). As a class, children volunteer line-by-line suggestions for a story using all the rolled pictures. Individual Writing Activity—Every child writes a story using the same stimulus pictures from the dice. At the end, compare all the different stories that came from the same pictures. Group Storyboard Activity— Preparation: introduce your class to the concept of a storyboard using examples from film production or comics/graphic novels. Activity: Split the class into groups. Give each group a set of five story dice. They are allowed to roll each die twice. Working together, each group must agree a plot using all the pictures they rolled. They will then convey this plot in a series of panels using a mixture of words and pictures. At the end, each group presents their storyboard to the class. In Isadora Moon Goes to School, Isadora must decide which school suits her best. She tries both Fairy School and Vampire school, with their very different timetables. In this activity, children look at the fairy and vampire school timetables, then create their own fantasy school timetable. The activity could be expanded to encourage pupils to think about different genres of writing: they could create prospectuses, adverts or posters for their fantasy schools, or write a story set in a magical school. This activity is suitable for slightly older primary school children. In the Isadora Moon series, Harriet Muncaster features her own versions of many well-known mythical creature. The information in this sheet serves as a starting point for children to research how Harriet has adapted these legends to suit the world of her stories. At the end, children are tasked with imagining their own encounter with a mythical creature. A series of prompt questions help them develop their ideas into a complete and compelling narrative.